If you require the short-term rental of evacuation products for domestic or commercial applications, GLOBEX can assist. We can provide evacuation chairs, transit chairs, and powered stair climbers for hire. We can even provide trained operators for commercial events to ensure complete peace of mind. If your lift has broken down or you have a visiting relative and require an immediate access and egress solution, then look no further - this is the solution for you. Hire an evacuation chair for domestic use from just £8.00 (+VAT) a day. Do you have a visiting relative that has a disability? Our domestic evacuation chair solution is ideal for home environments. Your traditional evacuation chair will not be appriopriate for every household stairwell, however - our agile eight-wheeled domestic chair will ascend and descend carpeted and non-carpeted stairs alike without any issues. Hire an evacuation chair for commercial use from just £18.00 (+VAT) a day. 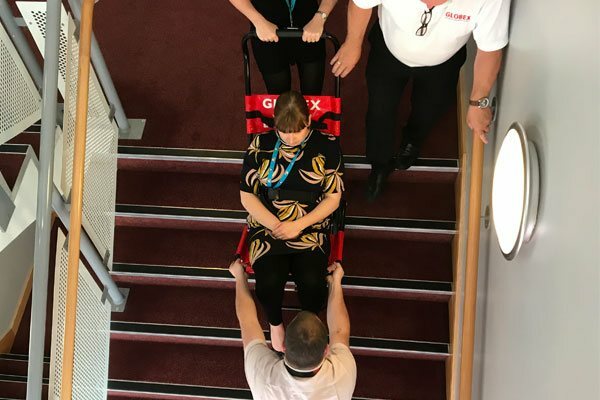 The GLOBEX Evacuation Chair 1 (GEC1) enables one person to evacuate a physically impaired person safely and easily down stairs in the event of an emergency or when lifts can not be used. This makes it ideal for all commercial applications and will give you the peace of mind that a reliable evacuation solution is in place that is easy to deploy and simple to operate. Hire a powered stairclimber from just £57.00 (+VAT) a day. Powered Stairclimbers offer peace of mind that a safe solution is in place when there is no alternative stair accessibility option available. The GLOBEX Powered Stairclimber makes it easy to ascend and descend stairs of any type without any physical exertion, in both commercial and domestic environments. The safe and reliable evacuation of the mobility impaired could not be made simpler.